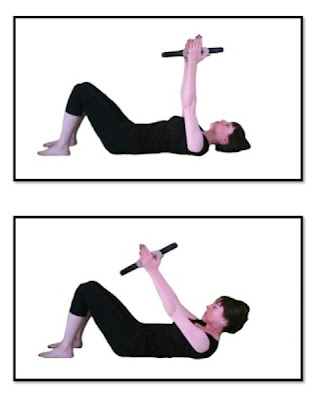 This exercise uses the resistance of the magic circle to assist in the abdominal curl. The circle aids the narrowing of the ribcage. To do this exercise you will need a mat and a magic circle. Start by lying on your back with your knees bent and your feet planted on the ground. Hold the magic circle above you with your arms straight and your palms facing the circle. Inhale into the back of the ribcage and exhale as you squeeze the circle and lift the head, neck, and shoulders. Inhale at the top and exhale as you lower the head, neck, and shoulders to the ground. Repeate 8-10 times. Narrowing the ribcage is a movement that is hard to find. It is so important to be sure that you are exhaling completely so that the diaphragm can release fully. 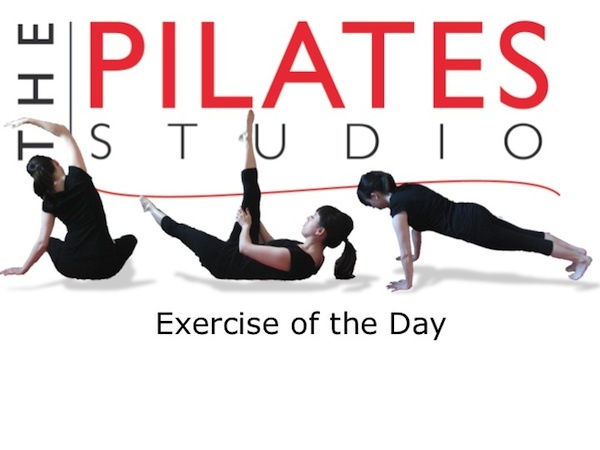 Then the ribcage can narrow and the abdominals can be engaged without compressing the spine. The shoulders should be plugged into the shoulder socket and the shoulder blades should be sliding down and around the back.